The man who personified television news for a generation of Vermonters passed away early this morning. Marselis Parsons, a longtime anchor and news director of WCAX-TV, died in his sleep at the Vermont Respite House in Williston after a battle with skin cancer. He was 70. Friends, colleagues and viewers remembered Parsons fondly. In his 42 years at the South Burlington television station, Parsons became a trusted journalist and unofficial dinner companion for families all over the state. Heidi Broe grew up watching Parsons every night on the evening news, often over supper, at her family’s home in Newport. Parsons announced floods and blizzards, wars and highway accidents, presidential bids and untimely deaths. Especially when the news was bad, it helped to have a familiar person telling the story, said Broe, a medical billing clerk who now lives in Holland, Vt.
Parsons, a Shelburne resident, retired six years ago but continued to report stories occasionally. After years of deadlines, retirement allowed him to spend more time with family and indulge his hobbies. He loved sailing, antique motor boats and dogs – especially corgis. Firefighting was also a passion and Parsons was at various times a volunteer firefighter. After a sore on his back was diagnosed as melanoma, Parsons stayed optimistic and tried numerous treatments, said his longtime friend Bill Felling, executive director of news services for CBS in New York and a former WCAX reporter who worked with Parsons from 1974 to 1982. Parsons dearly wanted to live to see his first grandchild and made that a goal during his treatment. The child, a little girl named Pippa, was born about six months ago. “It meant the world to him,” Felling said. Parsons grew up around the world as his father, a diplomat, was posted in various locations. According to Felling, Parsons acquired his nickname “Div” from his mother and father. “His parents considered him the dividend of their love for each other,” Felling said. Parsons was born in 1944 in New York. He graduated from Lafayette College in Pennsylvania in 1966 and landed his first broadcasting job at WTSL radio in Hanover, N.H., in 1966. He moved to WRLH-TV in Lebanon, N.H., that same year. He took a job at WCAX in 1967 and was working his way up when fate intervened in 1984. 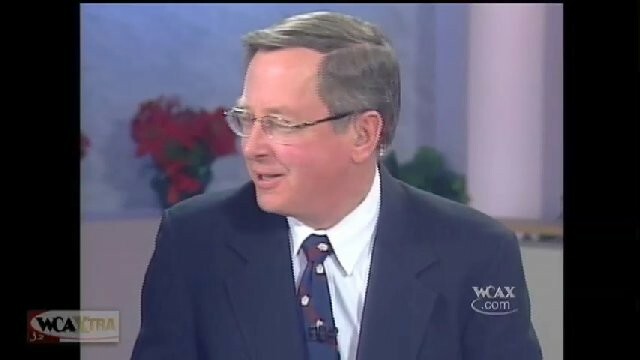 The station’s news director and anchor Richard “Mickey” Gallagher hosted an episode of the popular newsmakers show “You Can Quote Me,’’ then went home for lunch, never to return. Gallagher died suddenly of a heart attack. Parsons stepped into his role and performed admirably, recalled Peter Martin, president and owner of WCAX. “He had to step into the shoes of a revered, popular predecessor and made them his own,” Martin said. Reporting the news sometimes made people angry, and Parsons took this in stride, Martin said. “It can’t have bothered him too much because he loved the business,” he said. Though not unsophisticated, Parsons did not come off as a slick or heavily packaged TV personality. He was genial and compassionate at times, tough and assertive at others. Parsons liked spontaneity. Details on funeral arrangements were not immediately available Wednesday. Parsons leaves his wife Julie, their daughter Susan, son-in-law Will and grandchild Pippa. Many Vermont notables remembered Parsons Wednesday. From U.S. Rep. Peter Welch: "Marselis Parsons embodied the qualities all of us strive for in life but struggle to achieve — integrity, decency and respect for colleagues, friends and neighbors. Every day at WCAX, his passion for honest local journalism was on full display. He influenced the careers of countless young journalists along the way. And he inspired his viewers to be engaged in the Vermont tradition of civil debate and civic responsibility. He was always tough, but always fair. Vermonters trusted Div Parsons. And we will miss him." Correction, May 27: An earlier version of this post listed the year of Richard Gallagher's death incorrectly.